During the months of October, November and December, patrol deputies with the Thousand Oaks Police Department responded to an apartment complex located in the 2000 block of Los Feliz Drive numerous times regarding numerous vandalisms that occurred at the location. The vandalisms primarily consisted of spray paint graffiti to the vehicles of numerous residents at the location. Deputies identified a total of 20 victims. In November 2018, detectives with the Thousand Oaks Special Enforcement Unit began investigating the crimes. Detectives determined the first vandalism occurred on October 2, 2018, and only one vehicle had been damaged during this incident. Detectives spoke to the victim of this vandalism, who believed her ex-boyfriend, (S) Juan Hernandez, was responsible for all of the vandalisms that had occurred at the apartment complex. Detectives learned she had ended her relationship with Hernandez shortly before the vandalisms began. Detectives continued their investigation and gained evidence linking Hernandez to the vandalisms. During the course of their investigation, detectives determined Hernandez’ ex-girlfriend was in a sustained fear for her safety. Detectives also determined Hernandez had used his ex-girlfriend’s personal identifying information to establish a new credit card account. 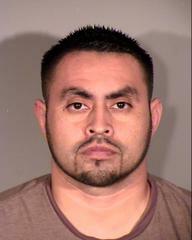 On December 19, 2018, SEU detectives located Hernandez as he was driving his vehicle on the 23 Freeway approaching Thousand Oaks. Detectives served a search warrant on Hernandez’ vehicle and located evidence linking him to the vandalism. Detectives arrested Hernandez for PC 646.9(a) – Stalking, PC 594(a)(1) – Vandalism and PC 530.5(a) – Identity Theft. Hernandez was booked into the East Valley Jail, where his bail was set at $250,000. On December 21, 2018, SEU detectives presented the investigation to the Ventura County District Attorney’s Office. The District Attorney’s Office elected to file the previously listed charges against Hernandez. Hernandez is still in custody at the Pre-Trial Detention Facility with bail set at $250,000.